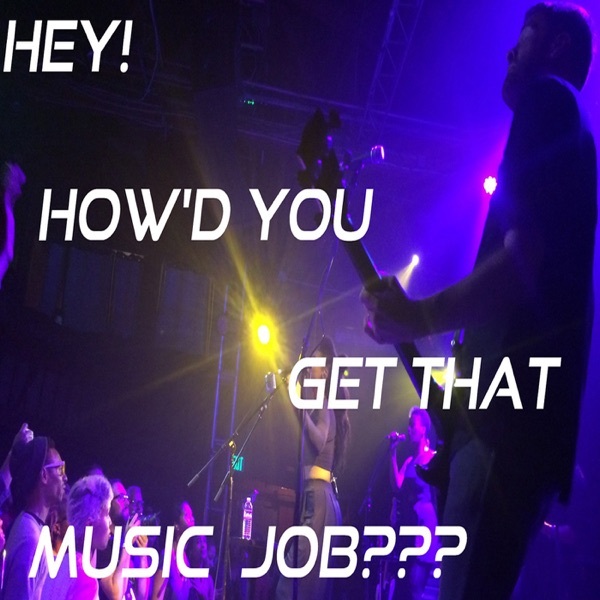 Hey, How'd You Get That Music Job??? | Listen Free on Castbox. Discover Hey, How'd You Get That Music Job??? Author: Hey, How'd You Get That Music Job??? Singer, Songwriter and Producer L.Ariel interviews talented, creative individuals from all facets of the music industry about their exciting careers. From musicians to marketers to managers and more, the movers and shakers who work in music today discuss their musical passions, their career trajectories, and share advice, insight and outlook about the ever-changing landscape of the music business. Whether you're just starting your music career or actively seeking a job in the music industry, this weekly podcast will keep you informed and inspired. http://therockstaradvocate.com Suzanne “Suz” Paulinski is the founder of The Rock/Star Advocate, a music business coaching consultancy who takes a specialized approach to her work. She calls herself a “mindset coach,” who helps her clients achieve a better work/life balance and to find clarity around their goals. With the endless, 24-7-365 onslaught of social media and … Continue reading "Ep. 60: A Holistic Approach to Your Music Career with Suzanne Paulinski"The post Ep. 60: A Holistic Approach to Your Music Career with Suzanne Paulinski appeared first on Hey, How'd You Get That Music Job???. http://joshuaturnermusic.com Joshua W. Turner is the epitome of a hard-working, dedicated musician. After discovering his passion for music at 15, he got accepted to the prestigious Berklee College of Music. After two years of study he made the jump to the west coast and Musicians Institute, catching the eye of prominent industry types and eventually … Continue reading "Ep. 59: Taking the Road Less Traveled with Joshua W. Turner"The post Ep. 59: Taking the Road Less Traveled with Joshua W. Turner appeared first on Hey, How'd You Get That Music Job???. http://jaredformanmusic.com Jared Forman is an accomplished musician and film and TV composer, working with greats like Danny Elfman and Kevin Kiner, as well as writing for hits like Jane the Virgin, Star Wars: Rebels, Making a Murderer, and several film projects with Justin Lee. Jared is also a talented music producer and recording engineer, working … Continue reading "Ep. 58: Innovation for Musicians, By Musicians with Jared Forman"The post Ep. 58: Innovation for Musicians, By Musicians with Jared Forman appeared first on Hey, How'd You Get That Music Job???. http://genius.com Devan Joseph, Head of Video at Genius, is documenting today’s rap and hip hop music creation and backstory in real time with their wildly popular, behind-the-music video series, “Verified.” Both an artist and filmmaker himself (part of the duo Maurice), Devan shares his music career trajectory as he walks us through his early inspirations … Continue reading "Ep. 57: Video as the Message and Muse with Devan Joseph"The post Ep. 57: Video as the Message and Muse with Devan Joseph appeared first on Hey, How'd You Get That Music Job???. http://crisvelasco.com Cris Velasco knows a thing or two about grit. He spent 7 years working day jobs (from retail to telemarketing!) until his big break into the gaming world. Now Cris has a worldwide passionate fan base and is one of the most sought-after, award-winning composers in the business, including his latest work on Fortnite, … Continue reading "Ep. 56: Creating Soundtracks for Interactive Immersion with Cris Velasco"The post Ep. 56: Creating Soundtracks for Interactive Immersion with Cris Velasco appeared first on Hey, How'd You Get That Music Job???. http://michaelbeinhorn.com Michael Beinhorn, Grammy award-winning writer and producer (Herbie Hancock’s “Rockit”), as well as a Grammy nom for Producer of the Year (Hole, “Celebrity Skin”, Marilyn Manson, “Mechanical Animals”), is responsible for wrangling and producing the Red Hot Chili Peppers’ first two breakthrough albums, producing and collaborating on seminal albums by Soundgarden, Social Distortion, Korn, … Continue reading "Ep. 55: The Essential Ingredients of Music Alchemy with Michael Beinhorn"The post Ep. 55: The Essential Ingredients of Music Alchemy with Michael Beinhorn appeared first on Hey, How'd You Get That Music Job???. http://johndelvento.net John DelVento truly understands the meaning of hard work. His passion and commitment started with 2 hour practices on the euphonium as a child, and he continued that drive to write music for advertising campaigns, video games, award-winning films, popular tv shows, documentaries and more. During this music careers episode, John walks us through … Continue reading "Ep. 54: Discipline is the Key to Success with John DelVento"The post Ep. 54: Discipline is the Key to Success with John DelVento appeared first on Hey, How'd You Get That Music Job???. http://johnmclucas.com John McLucas, drummer, singer/songwriter, producer, podcaster and recording engineer, is all about his music career. After Musicians Institute, he worked with several bands and toured with signed rising-star bands, playing shows with the likes of Tool and Primus before he decided he needed to strike out on his own to create a lucrative music … Continue reading "Ep. 53: Eat, Sleep, Make Music, Repeat with John McLucas"The post Ep. 53: Eat, Sleep, Make Music, Repeat with John McLucas appeared first on Hey, How'd You Get That Music Job???. http://matthewmayer.com Matthew Mayer is a busy guy – in addition to an MBA, a young family and a successful business career, he is also an award-winning, internationally renowned, Billboard-charting piano artist. Oh yes, and also a podcaster (“Going Solo”,) blogger, and founder of the popular online collective for piano artists, solopiano.com. During this special music … Continue reading "Ep. 52: Keeping an Energetic Focus on Your Music Career with Matthew Mayer"The post Ep. 52: Keeping an Energetic Focus on Your Music Career with Matthew Mayer appeared first on Hey, How'd You Get That Music Job???. http://cheriehu.com Cherie Hu, an award-winning music business journalist, was on track to be a classical pianist through Juilliard’s pre-college program when a teacher suggested an alternative program of dual studies. That brought Cherie to Harvard, majoring in math and stats, while writing for the university arts blog and an arts column for the Harvard Crimson … Continue reading "Ep. 51: Writing about Music, Tech, Algorithms and More with Cherie Hu"The post Ep. 51: Writing about Music, Tech, Algorithms and More with Cherie Hu appeared first on Hey, How'd You Get That Music Job?? ?.